Deputy Prime Minister Nick Clegg will face questions about his government role on a regular basis in the Commons. From 22 June the Liberal Democrat leader will take part in deputy prime minister's questions once a month, answering MPs inquiries for 30 minutes. Mr Clegg has responsibility for pushing through the coalition government's reforms to Parliament, which he says are the most ambitious for 150 years. He will stand in at prime minister's questions when David Cameron is away. 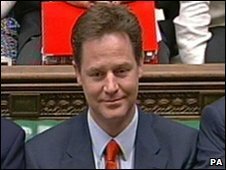 Mr Clegg is one of five Liberal Democrat MPs serving in the coalition cabinet. It is not clear who will lead Labour questioning of Mr Clegg. Since Gordon Brown's resignation earlier this month, Harriet Harman has been acting Labour leader as well as its elected deputy leader. It has been reported that Rosie Winterton, shadow leader of the House of Commons, could fill the role.